﻿ Shingles in Adults: Symptoms, Signs, Treatment and How Contagious is it? 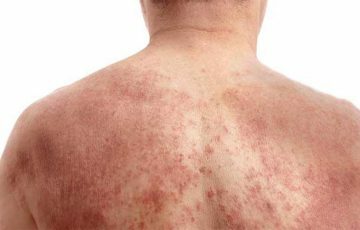 Skin Diseases > Shingles > Shingles in Adults: Symptoms, Signs, Treatment and How Contagious is it? Shingles is a disease of the nervous system but can be mistaken for a skin infection. It is caused by the varicella-zoster virus, the same virus that causes chicken pox in children and young adults. 1 in 3 persons will get the virus in their lifetimes. More than 50% of all cases are reported in people over age 50. This is associated with the weakening of immune system that comes with age. It is not possible to cure shingles even with antiviral drugs. Luckily, outbreaks last for 2-4 weeks and recurrence is not common. Regardless, shingles can be a source of much discomfort and intense pain. Patients are urged to seek medical attention within 72 hours of first signs of shingles. In this article, we investigate the signs and symptoms of shingles in adults. Rash and blisters are the typical signs of shingles. They appear 1-5 days after the first symptoms. 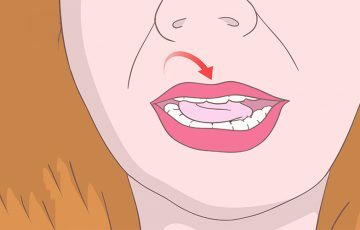 The unique thing about shingles signs is that they occur only on localized areas of the body and do not cross the body’s midline. Also, they tend to form a stripe or band-like appearance. 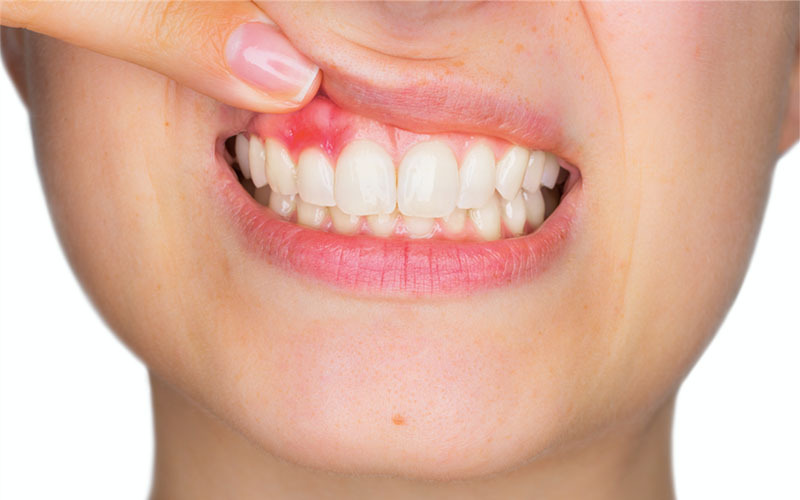 Affected areas start with becoming red, tender and inflamed. Red spots then appear which soon become lesions and ultimately blisters. New lesions may keep appearing for the next several days. Once blisters have formed, they often rupture and ooze before crusting over. Complete crusting over takes 7-10 days. Once crusted over, the normal healing process will commence. Shingles blisters usually heal without scarring. When severe outbreaks are involved, pitted or flattened, red or purple scars may appear. This can be seen in shingles in toddlers pictures. Symptoms of shingles include pain, itching, tingling, burning, stinging and flu-like symptoms. 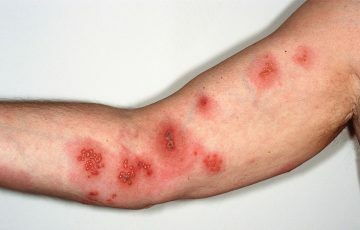 Early symptoms of shingles on the or elsewherearms can be mistaken for a flu or cold. They include fatigue, fever and nausea. 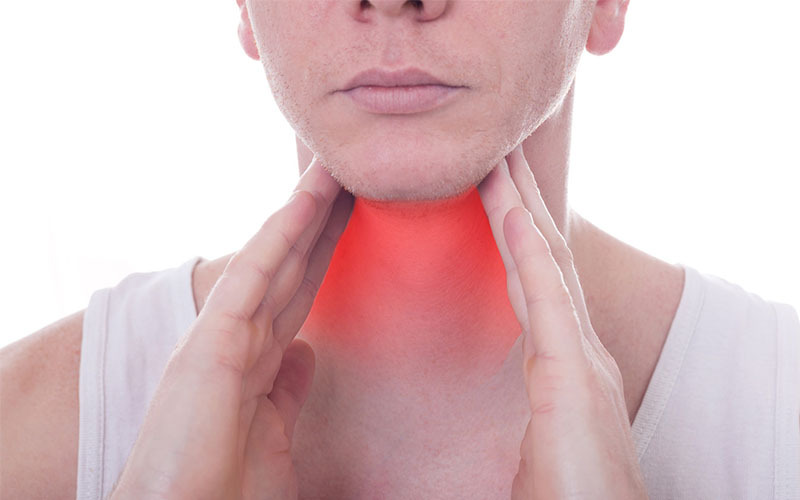 These symptoms are usually mild and can easily be ignored. A main difference is that shingles doesn’t cause runny nose. 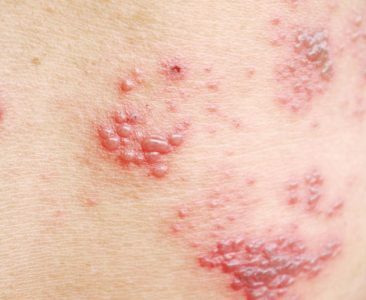 The symptoms persist until shingles approaches its final stages which are marked by complete crusting over of blisters. This is usually the first symptom. It begins with tingling, burning or stinging. A majority of patients are able to recover from shingles pain after about 4 or 5 weeks. This is the period it takes for shingles to completely go away. If pain persists, the condition is known as post-herpetic neuralgia. Shingles nerve pain is thought to be caused by nerve damage or inflammation. 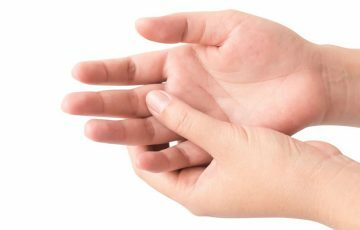 It arises within nerves but physical stimuli like touching can aggravate it. Post-herpetic neuralgia usually doesn’t improve with time. It requires treatment with medications such as antidepressants and anticonvulsants. How long does shingles last untreated? When no complications are involved, 5 weeks are the maximum a shingles outbreak lasts even without treatment. And how long does the nerve pain last after shingles? Normally, nerve pain disappears with other symptoms. But if it comes back after several days or weeks, it can last for years. 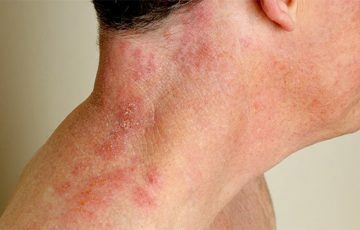 This condition keeps showing up in discussions about shingles. The reason this is so is because PHN is the most common complication of shingles. Risk factors include severe pain during outbreaks, severe shingles bouts and serious immune issues. Extreme head pain from shingles is a potential sign and risk factor of PHN. Problems associated with the heart seem like the last thing you would expect to worry about during a shingles outbreak. Apparently, they are not. Some experts argue that shingles bouts can elevate the risk of stroke and heart attack among other cardiovascular issues. The argument follows that replication of the herpes zoster virus inside arterial walls can result in the breaking free of fatty deposits which in turn may cause blood clots. As you may already know, this is the same process that leads to heart attack and stroke. Another argument is that prolonged or intense shingles nerve pain may cause a rise in blood pressure. In most cases, inflammation due to shingles occurs on affected nerves and sometimes on the skin. Adults over age 60 with serious immune issues can develop inflammation and swelling in internal organs such as lungs, brain, spinal cord and liver. Other complications of shingles include eye problems, Ramsay Hunt syndrome and bacterial infections. Most of them can be prevented with early treatment. Can you get shingles under your breast? Shingles can appear on any part of the body. When it occurs under or on the breast, it is not a sign of breast cancer. There is not much difference between how shingles in adults and children is treated. After diagnosis, your doctor will choose the best combination of medications to use. Below are the commonly considered options for how to treat shingles in adults. Examples include acyclovir and valacyclovir. They are not meant to cure shingles but prevent complications and shorten recovery period. For best results, treatment with these drugs should be started within 72 hours of early symptoms of shingles. Pain relievers can be prescribed by your doctor or be bought over the counter. Examples include paracetamol, ibuprofen and opioids. How exactly these medications work to reduce shingles nerve pain is not known. A possible explanation is that they inhibit pain receptors in the body. Corticosteroids are commonly used alongside antiviral drugs. They mostly work by reducing inflammation and nerve pain. Corticosteroids are commonly used during shingles in ear treatment to reduce inflammation inside the affected ear. 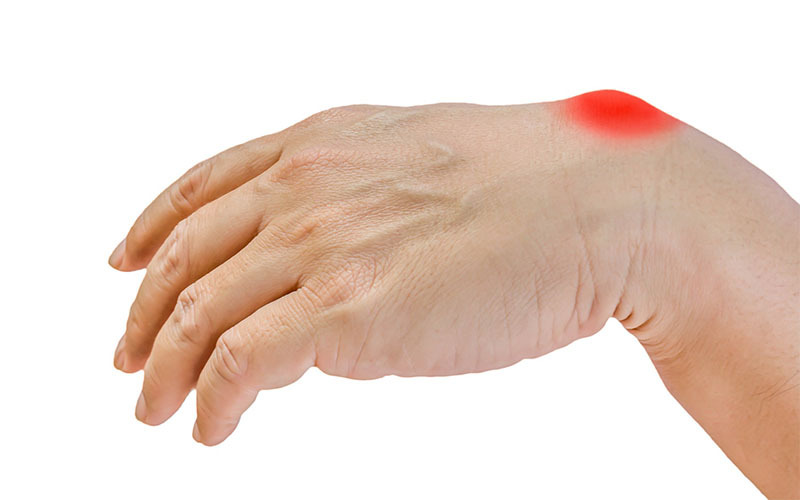 Cool compress reduces both pain and itching. It may also help keep affected areas clean so as to avoid bacterial infections. 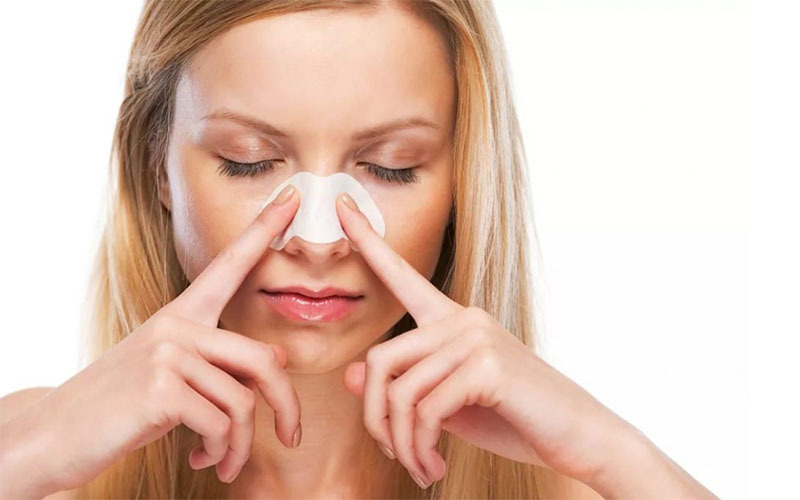 Since there are no drugs or chemicals involved when using cool compress, it is a considerable shingles on face treatment. Essential oils are commonly used to improve a variety of skin conditions. Since most of them are usually in high concentration, users are advised to dilute with carrier oil. Examples you can try include frankincense oil, lavender oil and tea tree oil. One practical prevention measure for shingles is to get vaccinated. 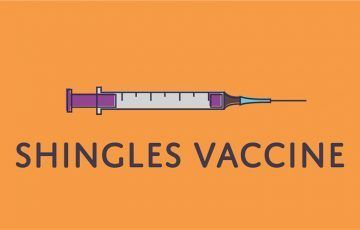 Currently, there are two shingles vaccines, both which are recommended for people over age 60. 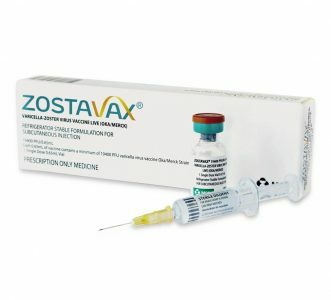 Zostavax is a live vaccine. It was approved by the FDA in 2006. The vaccine is given in a single shot and estimated to remain active for about 5 years. This vaccine is well tolerated, safe and effective. It has been shown to prevent about half the cases of shingles. It has also been shown to prevent about two thirds the cases of post-herpetic neuralgia. If shingles occurs after vaccination, signs and symptoms are much less severe. Shingrix is the new vaccine for shingles approved by FDA in 2017. It is indicated for persons over the age of 50 years. The vaccine may reduce the risk of getting shingles up to 90%. Its effectiveness is highest in individuals between 50 and 70 years of age. Shingrix also significantly reduces risk of prolonged pain or post-herpetic neuralgia. 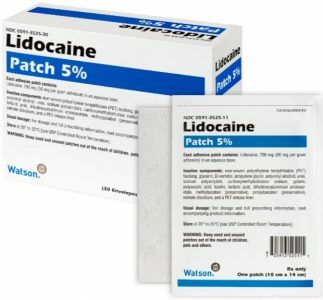 2 doses are needed, with 2-6 months between doses. People who have already been given Zostavax can also receive Shingrix. It is advisable to talk with your doctor before deciding whether to go for a shingles vaccine or not. Shingles is not contagious. However, herpes zoster can be passed to other people during direct contact when the rash is in blister-phase. 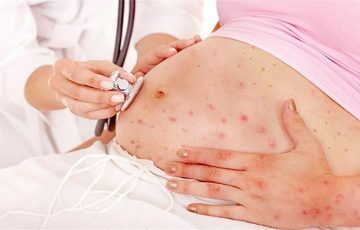 People who have never come into contact with the varicella-zoster virus will develop chicken pox. Apart from get vaccinated, prevention can also be done by boosting the immune system and covering shingles rash. Healthy diets and supplements are a main solution to boosted immunity. 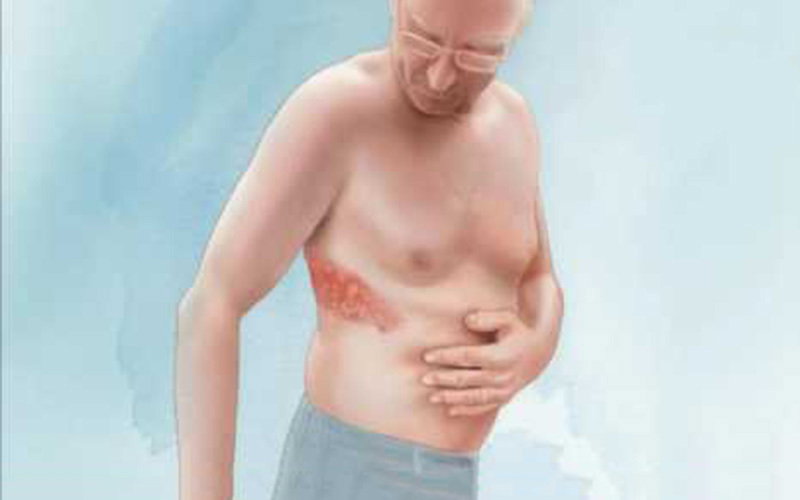 As for covering shingles rash, patients don’t need to be completely isolated. 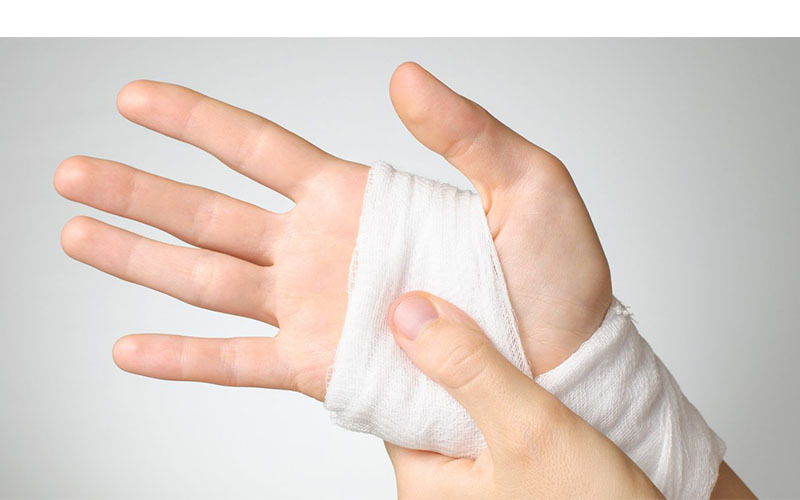 In any case, they stop being contagious once blisters have crusted over. This doesn’t take long. Most of the blisters will have crusted over by start of the second week.